Melissa Abdo and her advocacy group are applying organizing tactics to help increase FAFSA completions and college-going among disadvantaged students in Tulsa. The #ImpactAgent campaign celebrates people and organizations who have changed the way they do business every day, based on data, to improve the lives of students from cradle to career. Free college. That’s the idea behind a program hatched in 2007 by business, government and education leaders in Tulsa, Okla. Called Tulsa Achieves, it covers the cost of earning an associate degree for any high school graduate in Tulsa County. Among the requirements: students have to maintain a 2.0 average and complete the Free Application for Federal Student Aid (FAFSA). The FAFSA requirement shouldn’t be a big barrier to getting more students in the program, but it is. In 2014, only 52 percent of Tulsa County’s more than 7,000 high school seniors completed the FAFSA, which is used to determine a college-going student’s eligibility for federal grants, loans and work-study funds. When Melissa Abdo, Tulsa city director for the national advocacy organization Stand for Children, heard that a local education collaborative was interested in launching a campaign to increase that percentage, she remembers having a reflex response: Sign me up. So while it may have been a no-brainer, getting involved in the FAFSA campaign was a bit of a departure for Stand for Children. Founded 20 years ago, the organization is known nationwide for its work organizing parents and communities to raise their voices and use their votes to improve policies affecting kids. 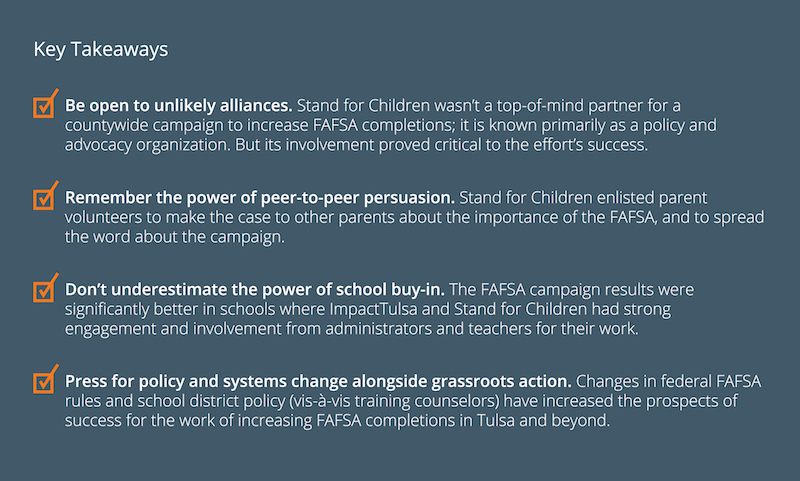 Getting more students to complete the FAFSA wasn’t a traditional policy or advocacy campaign, and yet it was Stand’s organizing and parent engagement experience that made the organization a perfect partner and leader for the work. “Melissa and her team put a lot of their other work on the back burner because they saw the game-changing potential of this campaign, and their involvement has been absolutely crucial to our success,” said Monroe Nichols, chief operating officer of ImpactTulsa, which led the FAFSA initiative. When ImpactTulsa crunched the numbers to gauge what it meant that 48 percent of high school grads in the county were not completing the FAFSA, Nichols and his colleagues were stunned. 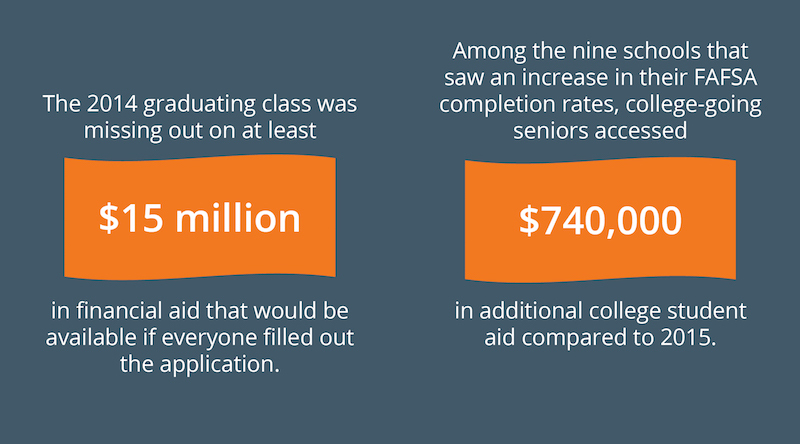 The collaborative’s research showed that the 2014 graduating class was missing out on at least $15 million in financial aid that would be available if everyone filled out the application. “If someone came to town offering that much scholarship money to people, they would be an instant hero. But we’re leaving that much on the table every year,” Nichols said. Armed with the data, ImpactTulsa started reaching out to partners to explore launching a countywide campaign to get more students to complete the FAFSA. 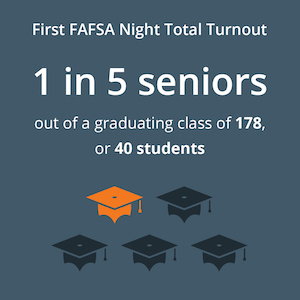 The proposed focus of the campaign was organizing “FAFSA Nights” at high schools where students and their families could find support and encouragement to complete their forms. Before long, ImpactTulsa built a roster of partners that included the local school districts, Tulsa Community College, the local state university (Rogers State) and more. Stand for Children signed on to lead the outreach effort for the FAFSA nights at two schools in Tulsa’s urban core. Under Abdo’s leadership, the organization approached the work like it was a classic political or advocacy campaign. Two weeks before the February FAFSA nights at each of the two schools, Stand for Children sent out a direct mail flyer to the households of all seniors advertising the event. Then, parent volunteers staffed phone banks and went door-to-door throughout the targeted neighborhoods providing additional literature and information. To make sure they were reaching the large Latino population at the two schools, the campaign included Spanish-language materials and telephone and community outreach by bilingual parent volunteers. For the first FAFSA night at one of the schools, Stand’s goal was to get 25 students and their families to show up out of a graduating class of 178. The total turnout was 40 students, or more than one in five seniors. With a school population that is more than three-quarters students of color and with more than 60 percent of students on free or reduced lunch, this school was an important focus for the countywide campaign. “This is a pretty typical urban high school and one where getting more students to complete the FAFSA can make a huge difference,” said Abdo. Turnout wasn’t as strong at the second high school. Twenty-two students showed up, three short of the organizers’ goal. But administrators and faculty at the school, which has a significant number of English language learners (20 percent) and students on free and reduced lunch (87 percent), told Abdo that the turnout was impressive just the same. Abdo noted that Stand had more cooperation and buy-in from school leaders at the first school in comparison to the second. She said her organization’s intensive outreach to the first school’s students and families complemented a range of in-school activities promoting FAFSA completion and the FAFSA night — such as counselors talking to students about it, the football coach making a pitch to his players and teachers using class time to get seniors to sign up for their federal student aid identification number. 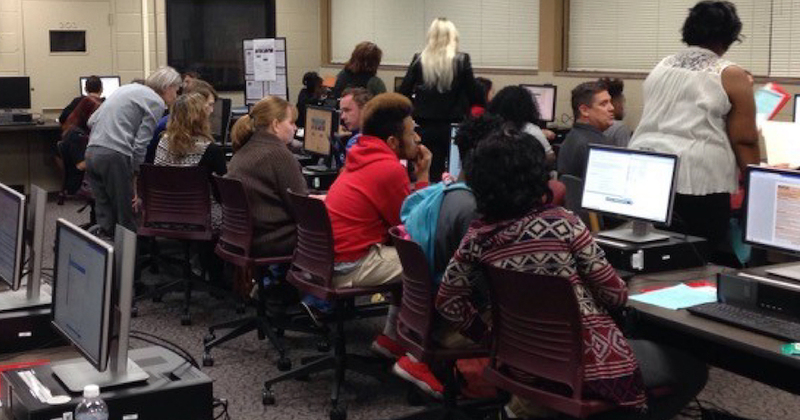 At each FAFSA night, college admissions representatives and others were available to talk with students and families about the FAFSA and to guide them through the process of completing the application. 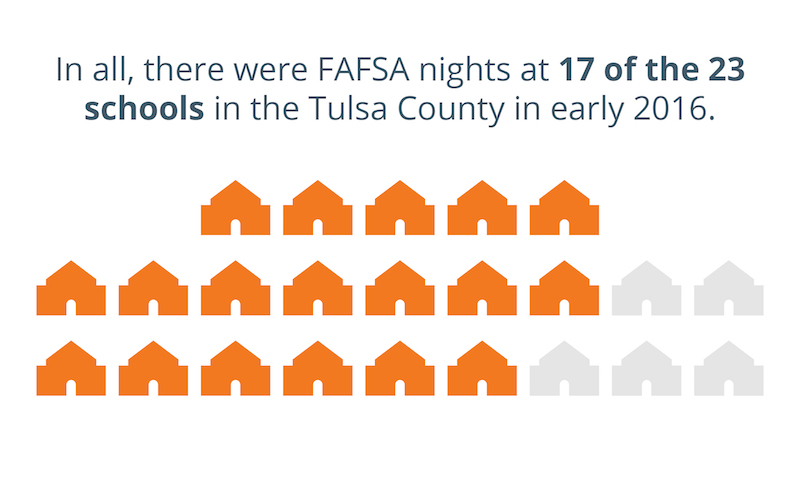 In all, there were FAFSA nights at 17 of the 23 schools in Tulsa County in early 2016. The partnership also launched a high-profile media campaign that included TV advertising, web ads, flyers and more. In addition to the FAFSA nights, ImpactTulsa teamed up with a local TV station to host an event, heavily promoted on the station’s evening news, where students and families could call in with questions about the FAFSA; college admissions representatives staffed the phones. “Sometimes families may not need or want to come out to an event, and they just want some quick questions answered about the FAFSA,” said Nichols in explaining the purpose of the call-in event. The overall goal for the campaign was to have 60 percent of county students complete the FAFSA in 2016, up from the 52-percent total recorded in 2014. In the end, the campaign fell short of its countywide goal of 3,645 FAFSA completions by a little more than 300 students (see graphic and results box). However, nine of the county’s 23 schools had completion rates that were higher than their 2015 numbers, and seven of those nine schools met or beat the campaign’s goal by increasing their completion rates by 8 percentage points or more. Among those seven schools, five were part of Tulsa Public Schools, the county’s highest-need district. Thanks to Stand for Children’s work, the two high schools where it focused its work both exceeded their campaign goals. 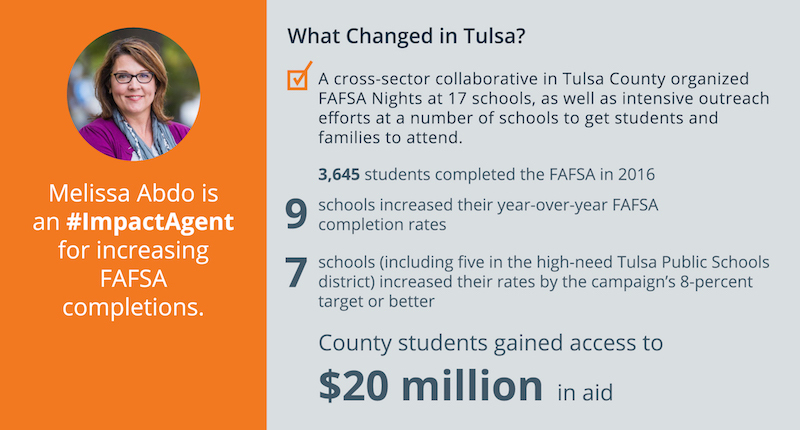 In fact, among all schools in the county, those that showed the highest year-over-year increase in FAFSA completions were schools where ImpactTulsa and its partners played an active role in promoting and coordinating the events. In contrast, the numbers tended to lag the countywide average at schools that organized events largely on their own. Abdo offered another lesson from the success of her organization’s partnership with ImpactTulsa and the schools. She said that engaging parent volunteers as front-line campaigners for FAFSA completion was key to the effort’s success. “What this work says is that when there is an intentional effort to include and involve parents and get them talking to other parents, then we have a real opportunity to move the needle for kids,” she said. Abdo’s belief in parent engagement and activism dates back to her own children’s earliest years in school. When her oldest daughter started school in a suburban Tulsa district, Abdo was concerned about the large size of the kindergarten class. In her efforts to get to the bottom of the problem, she eventually found herself in conversations with state lawmakers — and ultimately running for the legislature herself. Her campaign was unsuccessful, but she subsequently was elected to the school board in her children’s school district and took the Stand for Children job so she could have a voice in improving education in Tulsa and beyond. Abdo said her experience as a partner in the FAFSA campaign this year convinced her once and for all that one parent or one organization can only make a difference as part of a broader collaborative effort. “We all have limits on our resources and on our time, and so the only way to make real change happen is to come together,” she said. ImpactTulsa has calculated that county students who completed the FAFSA in 2016 gained access to $20 million in funds for their postsecondary education. Among the nine schools that saw an increase in their FAFSA completion rates, college-going seniors accessed $740,000 in additional college student aid compared to 2015. The collaborative will have data in December that will allow it to gauge if there was an increase in college attendance among graduates of schools that showed a bump in FAFSA completion rates. ImpactTulsa also is conducting analysis of what happened in the schools that registered the biggest gains from 2015 to 2016 so that it can help more schools increase their numbers in future years. According to Nichols, Stand for Children’s intensive parent-to-parent outreach provides a “great model” for future work in other schools across the county. For 2017, Nichols said ImpactTulsa is hoping to see the percentage of students completing the FAFSA cross the 60-percent threshold, and then keep moving up in the years after that. To increase the chances that it can reach its goals, Impact Tulsa is working with Tulsa Public Schools this year to provide high school counselors with specialized training on the importance of the FAFSA and how to get more students to complete it. Other positive harbingers for 2017 are two important changes that the U.S. Department of Education announced for the FAFSA process in 2016. First, students will now be able to submit the form earlier in the school year — on October 1 instead of the previous start date of January 1. Second, students will now be allowed to report their family’s income information from the year before instead of the current year. In the past, FAFSA applications were considered incomplete until students provided information from current-year tax returns. (1) Eric P. Bettinger, Bridget Terry Long and Philip Oreopoulos, The FAFSA Project: Results from the H&R Block FAFSA Experiment and Next Steps, July 2013. Accessed here.